Some coins are directly related to important events in American history. A prime example could be the 1943 Steel Cent, introduced after copper had become scarce, a direct result of the involvement of the United States in World War II. Another important example is the 1964 Kennedy Half Dollar, first year of issue for this design, which replaced the Franklin Half Dollar which had been in production since 1948. The historical event which led to the introduction of this design, as most coin collectors will know, was the assassination of President John F. Kennedy on November 22, 1963. Soon after the assassination, it was decided that the former President would be commemorated on the circulating half dollar coin. The first choice appeared to have been the quarter dollar, which had been circulating with a design of George Washington, since 1932. However, Jacqueline Kennedy, the wife of the late President Kennedy, requested that the image of George Washington should not be replaced with the image of her late husband. In accordance with her wishes, the half dollar was selected as the denomination. A change in design for the half dollar required a change legislation to be passed since by law circulating coin designs had to be used for at least 25 years, before being replaced. As this was being done, Gilroy Roberts (obverse) and Frank Gasparro (reverse) started work on the new Kennedy half dollar. Less than a month later, the design was ready and approved, and production of Proof coinage would commence in early 1964. The first circulation strikes were delivered in March, with a quantity of roughly 26 million pieces the first Kennedy Half Dollars to reach the public. The obverse design for the coin featured a portrait of President Kennedy based on a presidential medal created shortly before his death. This design had actually been approved by President Kennedy himself. For its use on the half dollar, Jacqueline Kennedy suggested subtle changes to the details in the hair, which gave rise to the accented hair variety found on some proof coins. Inscriptions on the obverse include “LIBERTY” in widely spaced letters above, the motto “IN GOD WE TRUST” across the neckline, and the date below. The reverse design, which was based on the Presidential Seal, featured the heraldic eagle with a shield at its chest and an olive branch and bundle of arrows in its talons. A ribbon in the eagle’s beak includes the motto “E PLURIBUS UNUM” and fifty stars are placed around the image representing the number of states. The reverse inscriptions include “UNITED STATES OF AMERICA” above and “HALF DOLLAR” below. By the end of 1964, the Philadelphia Mint had struck 273,304,004 Kennedy Half Dollars, while the Denver Mint struck 156,205,446 coins. Additionally, the Philadelphia Mint struck 3,950,762 Kennedy Half dollars in Proof format, for sale to collectors within the 1964 Proof Sets. All of these numbers were significantly higher compared to the numbers from the previous Franklin Half Dollar series. In fact, the total number of 1964 Kennedy Half Dollars was not far off from the entire output of Franklin Half Dollars for all years of the series from 1948 to 1963. It is not difficult to determine the reason why the mintage of the 1964 Kennedy Half Dollar was at such a high level. The recently deceased President had been extremely popular during his lifetime, and the public was incredibly saddened by assassination. When the first coins bearing his portrait were released to the public, they were quickly hoarded and even traded at a premium despite the hundreds of millions which would eventually be released. This activity leads to a relatively high number of 1964-dated half dollars remaining available to collectors, even in uncirculated condition. The 1964 Kennedy Half Dollar also holds distinction as the final half dollars struck for circulation within the composition of 90% silver and 10% copper. Due to a rising market price of silver, the Mint reduced the silver content of the half dollar to 40% the following year, and then removed the silver content altogether after 1970. This has also increased popularity of the 1964 Kennedy Half Dollar, which trade for a premium in circulated grades based on the value of the silver content. The finest known circulation strike 1964 Kennedy Half Dollar is a single example from the Denver Mint which has been graded PCGS MS68. This issue has not changed hands publicly, but would almost certainly establish a price record for the issue. Just under 70 examples have been graded MS67 by PCGS, with the number split between coins from Philadelphia and Denver. When offered for at auction, the sales prices have varied widely from just over $1,000 to a high of $2,820 based on the eye appeal of the particular example. The grading firm NGC has not graded any circulation strikes at the MS68 grade level. The finest known pieces at this service include 65 examples graded MS67. Only a dozen are Denver Mint issues, with the remained from Philadelphia. The NGC MS67 graded examples have seen lower selling prices, ranging from around $700 to just over $1,000. It’s also worth noting that there are some high grade coins which are offered as specimen strikes, meant as prototypes for the SMS coins struck between 1965 and 1967. The finest of these are two SP-69 examples, graded by NGC, one of which sold for $ 16,100 in July 2003. It has to be noted, however, that these are classified as different from regular circulation strike or proof 1964 half dollars. The finest Proofs graded by PCGS with the Deep-Cameo designation are 79 PR69DCAM’s. There have also been 248 coins graded as PR69CAM, and more than 2,000 pieces without a designation graded PR69. 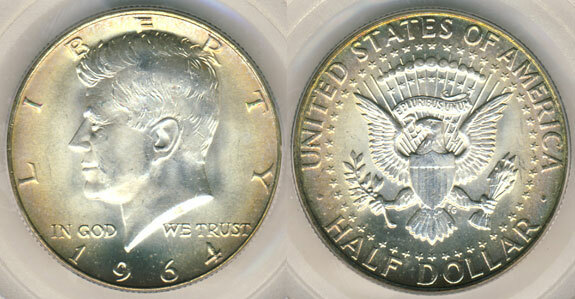 There have been 29 examples of the 1964 Proof Kennedy Half Dollar graded PCGS PR70, one of which sold for $9,400. The examples graded PCGS PR69DCAM have sold for prices ranging from about $1,500 to $2,500. At NGC, there have been 109 pieces graded PF69 Ultra Cameo, 555 pieces graded PF 69 Cameo, and nearly 3,000 pieces graded PF 69 without designation. There have been no coins graded at the PF 70 level. Prices for the examples graded NGC PF 69 Ultra Cameo tend to range from about $1,000 to $1,500. For the accented hair variety, which is much more difficult to find with Cameo contrast, PCGS has graded only nine PR68DCAM’s, along with nine PR69CAM’s and 48 PR69’s. 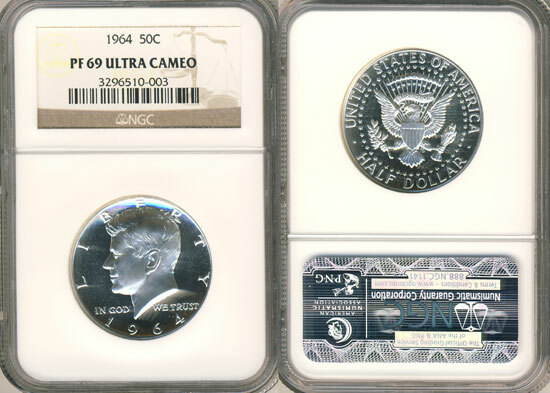 NGC has graded two examples of the variety as PF 69 Ultra Cameo and ten PF 68 Ultra Cameo’s. NGC has also graded 35 pieces as PF 69 Cameo. The highest price paid for an accented hair Kennedy Half, at public auction, was $12,650 for a PCGS PR68DCAM in 2008. Another example in the same grade sold for $ 11,500 a year later.